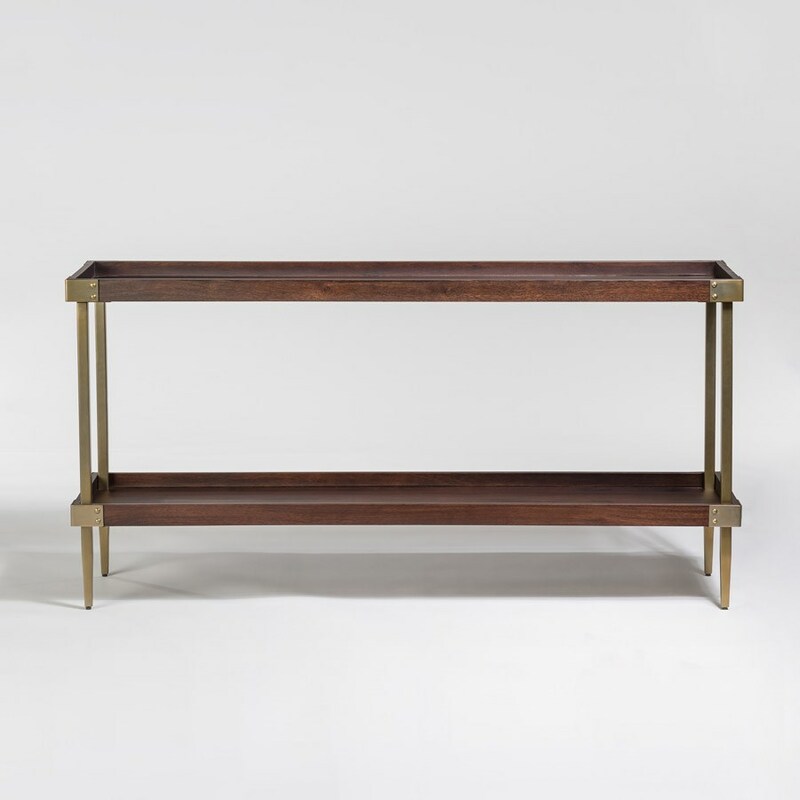 With its rich Walnut finish and metal accents, this console table exudes sophisticated modern style. The tray-style top and shelf put a smart twist on the piece, while the tapered legs and clean lines give a nod to mid-century modern design. Use it to display decorative accents in your entryway, hallway, or living room. The Avenue Console Table with Tray Top by Alder & Tweed at Furniture Mart Colorado in the Denver, Northern Colorado, Fort Morgan, Sterling, CO area. Product availability may vary. Contact us for the most current availability on this product. Wood & Finish Walnut wood finish and Antique Brass metal finish. Case Detail Tapered metal legs. Tray tops and shelves. Case Construction Mango wood and metal. Sleek and simple with a touch of mid-century modern style, the Avenue collection exudes contemporary sophistication. Tray-style table tops and shelves put a fresh twist on a basic silhouette, while metal legs in an Antique Brass finish add the perfect amount of shine. The Avenue collection is a great option if you are looking for Mid-Century Modern Contemporary furniture in the Denver, Northern Colorado, Fort Morgan, Sterling, CO area. Browse other items in the Avenue collection from Furniture Mart Colorado in the Denver, Northern Colorado, Fort Morgan, Sterling, CO area.